Five core businesses diversify our sources of revenue and broaden our capabilities for clients. We are conservative in our use of debt and have significant unused bank commitments. Our net capital is well in excess of regulatory requirements. 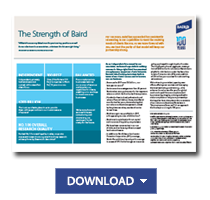 Baird offers client account protection in excess of SIPC limits through a special Lloyd’s of London insurance policy. 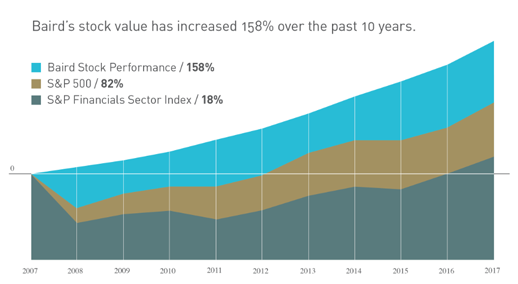 Our inherent stability enables us to reinvest in our capabilities and resources for clients, even in down market environments. Of course, our real strength comes from the trust and confidence our clients place in us, best exemplified by more than $208 billion* in client assets they have entrusted to us. 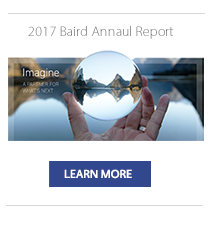 View Baird's Statement of Financial Condition reports.